It’s nearly impossible to describe the exceptional talents of EMISUNSHINE, a 13-year-old East Tennessee prodigy who has captured the nation’s attention as a singer, songwriter and multi- instrumentalist. Steeped in Appalachian music, Emi is a true vocal stylist. Influenced by legends who have made history (Loretta Lynn/Tanya Tucker/The Louvin Brothers), Emi has taken the world by surprise with her ability to combine her youthful, bubbly disposition with deep, meaningful and rather dark song content seeped in lonesome. Bringing her imagination to life, Emi has been able to write and record her own music, cementing her reputation as a well-crafted storyteller. The fearless performer has performed on The Today Show, The Grand Ole Opry and at The Ryman, making evident her confident musical direction. Since her break-out at 9 years old, Emi has garnered more than one-half million Facebook followers. While her music has been described as “old-timey,” she adds her own unique blend of roots music that is equal parts Americana, Bluegrass, Gospel and Country, with a sprinkle of Blues. 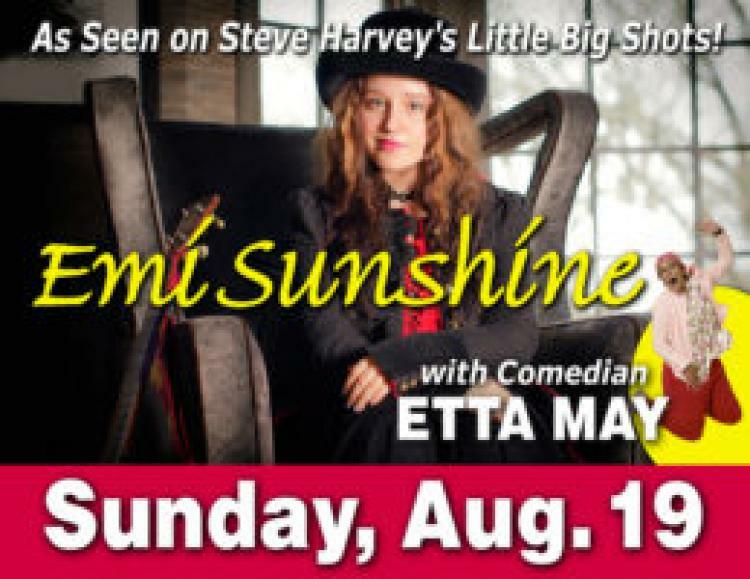 An indescribable and inexplicable talent, EmiSunshine is a must-see- to-be-appreciated classic! Gaylord Entertainment was brought on board to collaborate in writing, directing and producing a nightly show incorporating many musical genres. Gaylord Entertainment, then owner of the Grand Ole Opry, Opryland USA Theme Park, Opryland Hotels, TNN & CMT, was no stranger to big time show business and brought a talented team from Nashville, Las Vegas and Los Angeles to write, choreograph, costume and produce the first season’s shows called American Pride and Christmas in Dixie. Turn the page to 2017 and the Alabama Theatre remains at the forefront of entertainment venues on the East Coast with Gaylord Entertainment continuing to produce their signature shows ONE The Show and The South’s Grandest Christmas Show. The Guest Artist Concert Series also brings in top touring acts once a week like Jay Leno, Three Dog Night, Josh Turner, Wynonna Judd, Temptations & Four Tops and many more. The theater was recently nominated for the Country Music Association’s Venue of the Year award. Planning for each year’s shows begins many months prior to the grand opening before a live audience. Creative direction is set first with the goal of making the new year’s show fresh and exciting for returning patrons by introducing new songs, scenic elements, costumes and performers. Next, writers, choreographers, music directors and technical experts develop the new show and prepare for rehearsals and scenic implementation. Extensive rehearsals follow involving the singers, dancers and band learning the new show under the direction of the production team. Even the technical crew is integral to the rehearsal process since they must perfect the flow of the show backstage. The Alabama Theatre shows remain on the cutting edge of entertainment technology by adding new scenic, video and sound elements to the 2018 shows. The Alabama Theatre is proud to have been voted the Best Live Entertainment Theater in Myrtle Beach by both visitors and locals numerous times. The theater works very hard to make sure both our signature shows, ONE The Show and The South’s Grandest Christmas Show, are special entertainment experiences for all our visitors.